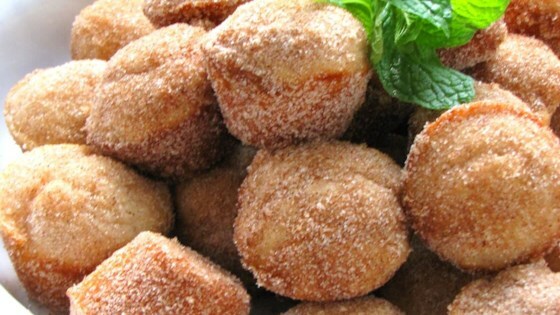 "Mini muffins that taste just like cinnamon sugar doughnut holes! The secret ingredient is nutmeg." Mix 1/2 cup sugar, 1/4 cup margarine, and nutmeg in a large bowl. Stir in the milk, then mix in the baking powder and flour until just combined. Fill the prepared mini muffin cups about half full. While muffins are baking, place 1/4 cup of melted margarine in a bowl. In a separate bowl, mix together 1/2 cup of sugar with the cinnamon. Remove muffins from their cups, dip each muffin in the melted margarine, and roll in the sugar-cinnamon mixture. Let cool and serve. See how to make mini muffins that taste just like cinnamon-sugar donuts. Use either butter or margarine. These weren't that great. I followed the recipe & we thought they were kinda dry. Will not make again.